From animal prints and neon to floral and colour-blocking: there’s a dress style to suit everyone. Which one will you be wearing this season? While leopards might not change their spots, the same can’t be said of designers and this season they’ve gone wild pairing big-cat prints with dresses that purr with feline appeal. 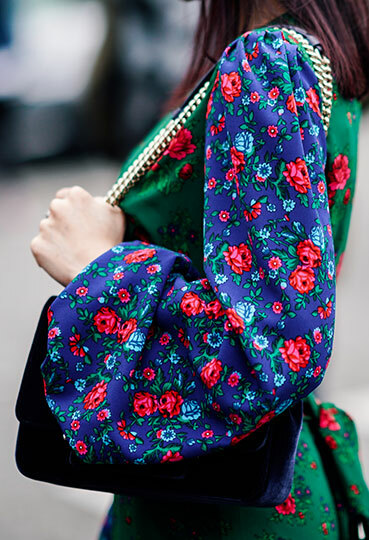 Feminine florals have had a reboot too, with larger-than-life prints taking the dress centre stage – and why be a wallflower when you can bloom in statement florals? Want to give your wardrobe an even bolder twist? Try mismatching the pattern for serious style points. If you’re not ready to let go of orderly outfits, you can always pair your dress with a matching-print handbag in a different colour. Dial up your dress code with neon colours that encourage you to stand out from the crowd. Bright colours lift the spirit like nothing else, and if spring is a bit slow to get going, start the party yourself with blocks of shocking pink, Day-Glo yellow or brilliant Curaçao blue. When worn as part of an eye-catching dress, these shades are fresh, funky and fun – and the perfect throwback to 90s style. Gently does it with another key colour trend this season: pastels. While neon shades light up the night, pretty pastels and earthy tones take the day dress firmly into feminine territory. These flattering easy-going shades signal low-key luxe and understated sophistication. Whether you’re relaxing at the weekend or going from work to a cocktail party, the dress is the most versatile garment around. And this season’s styles are endlessly versatile, with a host of silhouettes and lengths to suit every wardrobe. Choose boho midi dresses and maxi-length prairie styles for a touch of Americana, with added quirk in the form of high necks, puff sleeves, tiered skirts and ruffles. Or float through spring and summer in an elegant chiffon tea dress or simple but chic wrap dress. A sporty polo dress is brilliant for the beach, a weekend barbeque or seeing the sights on a city break, while for A-list worthy partywear try the new asymmetric shape, with a handkerchief hem or dare-to-bare single shoulder. Divine details set this season’s dresses apart from the pack. Take your pick from 80s retro touches, such as oversized bows and puffed hems, or 70s-style fringing. 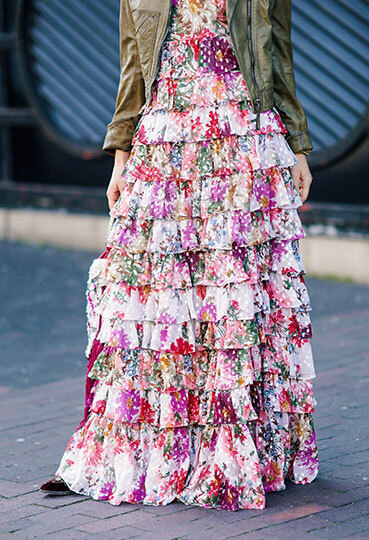 For a touch of romance, revel in ruches, ruffles, frills and pleats for dresses with flirty, feminine charm.